We meet usually on the second Friday of the month at Downstairs at The King’s Head in Crouch End and sometimes at the Union Chapel in Islington. Make sure you check the What’s On page to see which venue we are using and for more details on how to buy tickets. 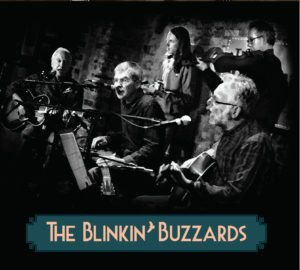 Now you can buy The Blinkin’ Buzzards’ CD, packed with great tunes like Jigsaw Puzzle Blues, Blue Prelude, Humming Blues and Big Feet Rag. The CD contains 11 tracks plus a bonus track, Pizza Rider, by Merlin Wildman. The CD costs £12 plus £2 p&p. Order yours today! By Eddie Lang, born Salvatore Massaro in Philadelphia in 1902.